As I posted last week, I received some great news when Panini notified me that One of my redemptions has finally been filled. 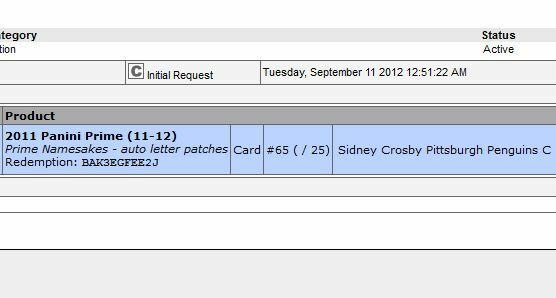 This wasn't any ordinary autograph from some third-rate rookie, though, but one of Sidney Crosby that I had redeemed over four months ago. 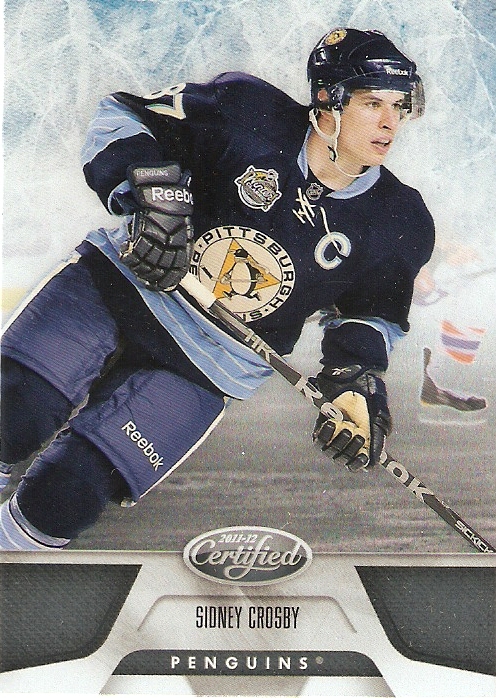 Good things come tho those who wait, because here's the newest addition to my Sidney Crosby collection. The card, numbered 13/25, comes from 2011-12 Panini Prime and is from their Namesakes insert set, which has the player signing on a manufactured patch designed to look as if it came from the player's nameplate. What I really like with this card is how accurate they were on the material used. 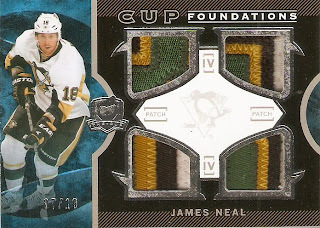 While most teams just use plain fabric, the Penguins use w material with a herringbone texture to it as the base for their letters and numbers, and Panini was able to use that same fabric to recreate the overall look. 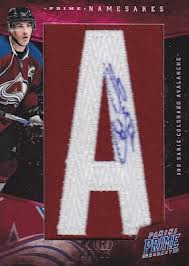 While most signatures on these manufactured letter patches are done on the letter itself, this one is different in that the signature is on the base fabric, next to the letter. I've seen this on a few other cards, especially of the Penguins, and I wasn't sure about it at first, but really, I see it as a necessity. With all the space that is taken up with the stitching, and compressing the letter to fit in the allotted space, there simply isn't enough room to make it work on the letter. I'd rather them be more accurate with the look of the letter anyway. It took a while to get this cards, but seeing it in hand, it was well worth the wait. 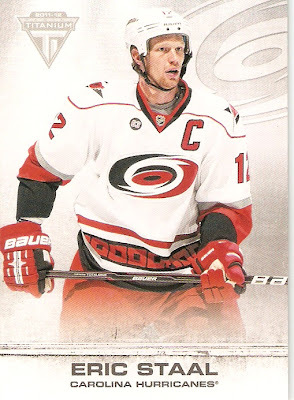 Last year, I opened up a couple packs of Upper Deck SP Game Used Edition, and left disappointed. Then, I saw some box breaks on Youtube, and became more disappointed, causing me to have avoided that product like the plague. 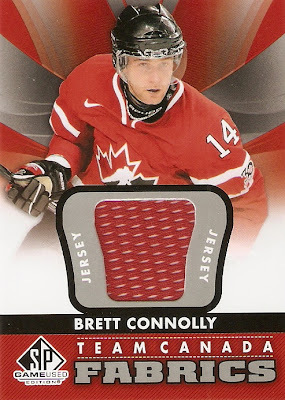 Apparently, I wasn't the only one, as Upper Deck took measures to make this a better product. Well, if they are really trying to fix what was broken, I figured I'd give them a shot. Here's what I came up with. 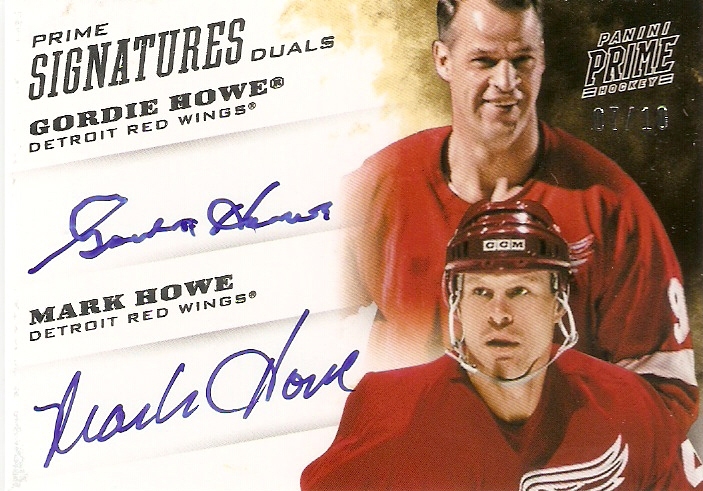 Each box contains five packs of five cards, one of which is an autograph or memorabilia card. With most products, the autos are usually the chases, but this product, like Panini Prime, does some pretty cool things with the memorabilia, so the autograph might not entirely be the big drawing point anyway. 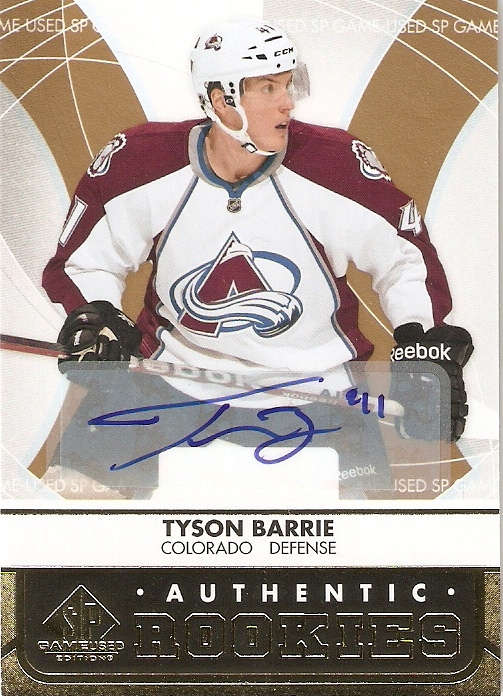 Speaking of autographs, my one autograph was of Avalanche rookie defenseman Tyson Barrie. The rookie played in just 10 games last season, but appears to be a mainstay this year, so we'll see how this guy turns out. 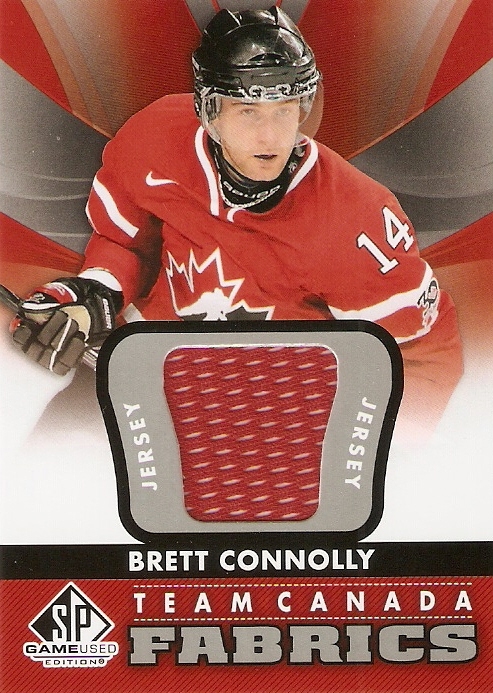 Next up is a Team Canada Fabrics card of Tampa Bay Lightning right winger Brett Connolly. 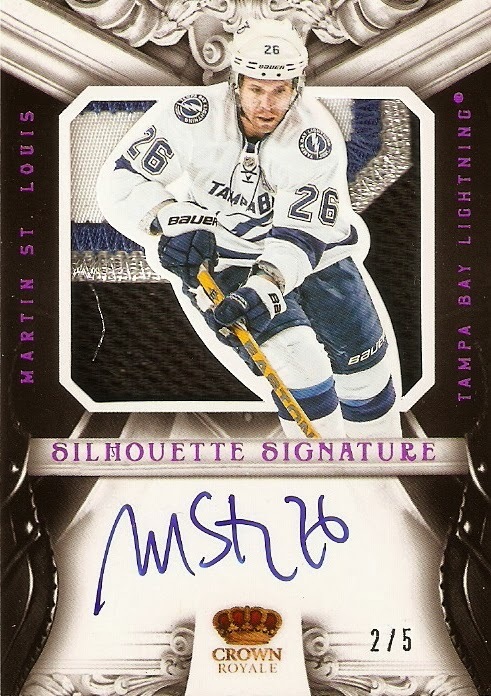 He spent 68 games of his rookie season with the NHL team, but right now, he is playing with the Lightning's AHL affiliate Syracuse Crunch, where he has scored 15 goals and 19 assists in 38 games. 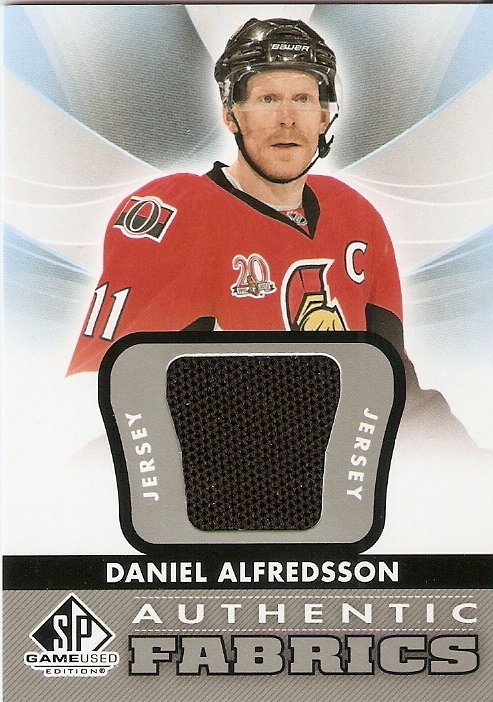 Next up is a guy who may be stalking me via cardboard, Daniel Alfredsson. I only say that, because he seems to always creep up in packs that I open. In fact, of the two packs of Game Used I opened up last year, he was one of the hits that I pulled. 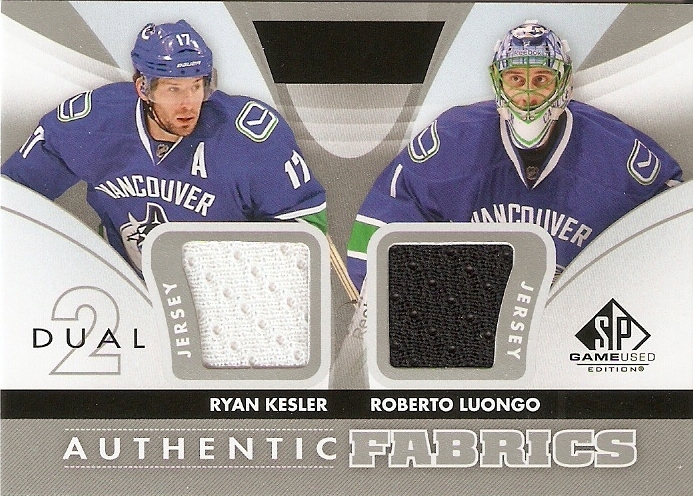 Next up is a dual jersey card of Ryan Kesler and Roberto Luongo of the Vancouver Canucks. Luongo may soon be dealt, as the team appears to have decided on Cory Schneider as not only their goaltender of the future, but of the present as well. Still, I like Luongo, so this was a good card for me to pull. Lastly, is my big hit of the box, and what a big hit it was! 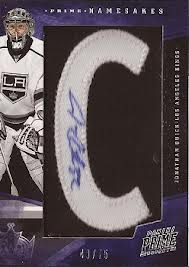 I was lucky enough to pull a super rare Dominik Hasek Supreme Patches card, numbered 5/12. 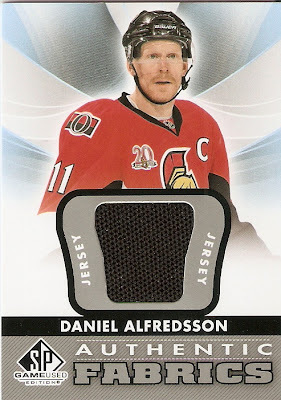 This is a beautiful looking card featuring a piece of the logo from the front of the jersey while Hasek was playing for the Ottawa Senators. 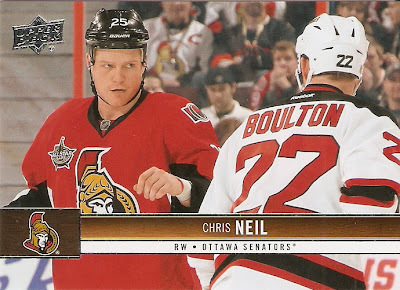 Although his time with Ottawa was brief (just the 2005-06 season), it's really cool that they were able to match up the photo to the team from the patch. 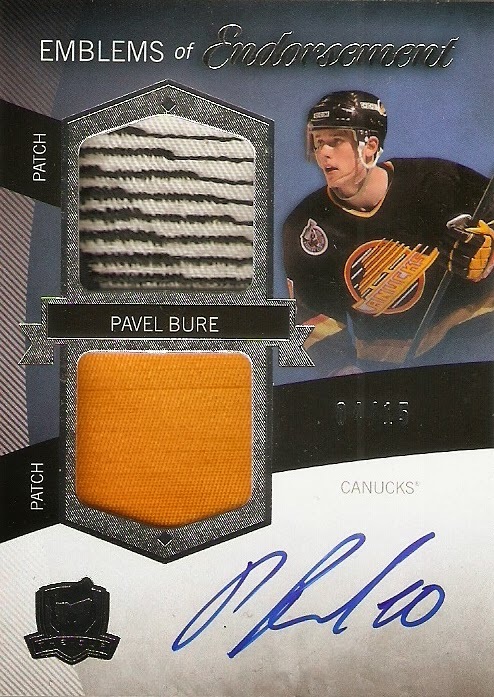 I was planning on keeping this card, seeing how it is an awesome four-color jumbo patch of a future hockey hall-of-famer, until I saw what another less-cool Hasek patch went for on Ebay. 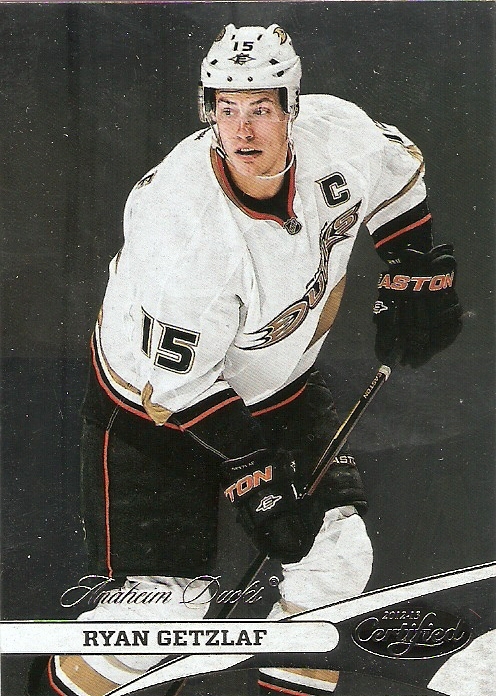 So needless to say, I went ahead and listed mine, and will use those funds to pursue this card. Well, there you have it. I definitely like some of the improvements they made this year and was very happy with my purchase. Single packs at $25 a pop will get very risky, especially with all the $.99 jersey cards in the set, but a full box should at least give you something to make it all worthwhile. 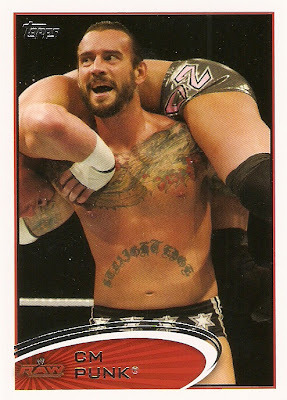 To celebrate the 2013 Royal Rumble, I decided to pick up some WWE cards, specifically, a box of 2012 Topps. Like years past, the set mirrors that of the baseball set from its respective year, which I really like. The last 2 years, they did that with baseball, wrestling, and football, but this year, for some reason, they decided to do something different with football. Anyway, apart from all that, the other thing I like about picking up a hobby box, is that with it being just a 90-card set, one hobby box will allow you to complete it. With few wrestling collectors out there, it can be tough to make trades for any set fillers, so it's nice not to have to do that. 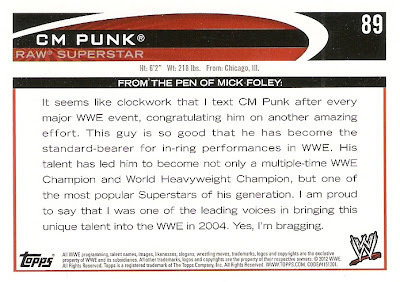 Since there are no stats, the backs of the cards include a short paragraph on the wrestlers. In years past, I think, these were written up by Michael Cole. This year, though, they got Mick Foley, which gave it a different perspective. Topps also did SP variations of card #7, Mick Foley. 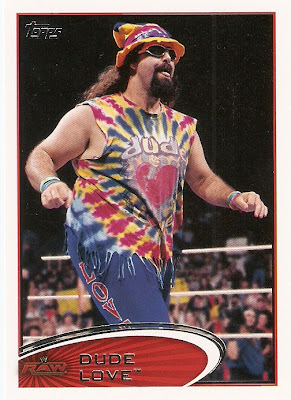 As can be expected, the variations for this card are of the "three faces of Foley," Cactus Jack, Mankind, and Dude Love. My box contained the Dude Love SP. 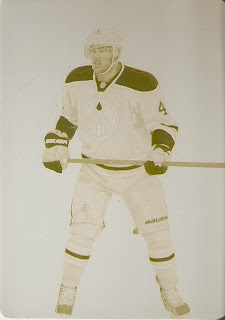 As with any Topps product, there are parallels, but I like how they kind of toned it down this year. 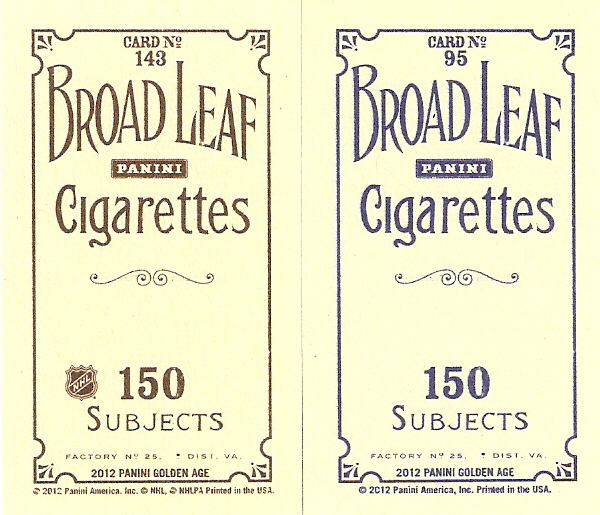 They aren't serial numbered, but blue parallels are inserted 4 per box and gold foil parallels are one per box. My blues were of Daniel Bryan, Natalya, Epico, and Matt Stryker, and my gold was of Alicia Fox. 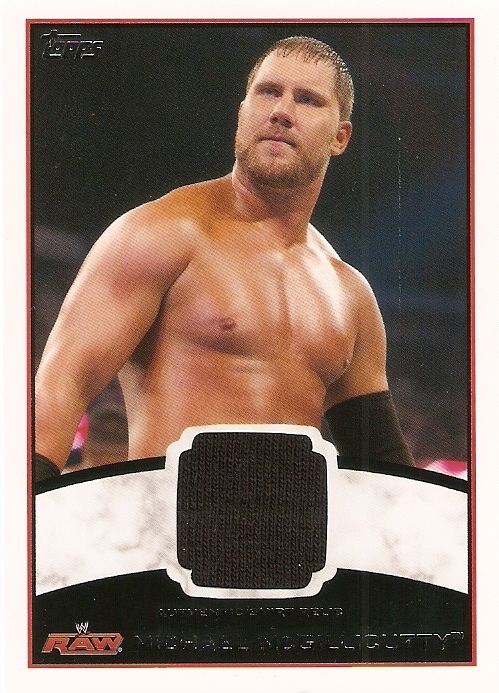 For the inserts, I got six Hall of Fame cards, which obviously focus on wrestlers inducted into the WWE Hall of Fame. In addition to having cards in the base set, the WWE divas also get their own insert set. The First Class Champions cards are pretty cool looking, but my only complaint is that they use a foil version of the modern "spinner" belt, even if they didn't win that version of the WWE title. It would have been nice to have Brock Lesnar with the "undisputed" title and Mankind and Yokozuna with the "winged eagle." Also, Mankind won the title when he had his dress shirt and tie attire, never when he had the original all-brown, but maybe I'm just nitpicking here. 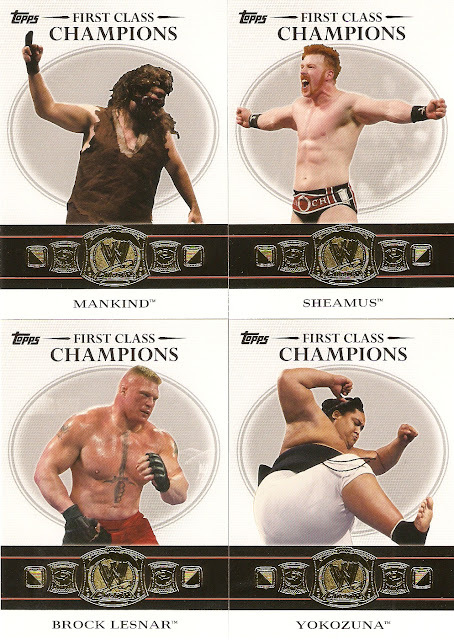 Another cool insert set is the World Class Events, which is simply a card of one of the better WWE pay-per-view posters from 2011 and 2012. Lastly, in the realm of inserts, is Top Class Matches, which focuses on current WWE Champion CM Punk's greatest WWE matches. My first hit from the box was a shirt relic of Michael McGillicutty, also known as Joe Hennig, son of "Mr. Perfect" Curt Hennig. The relic is a plain black piece of cotton, which most likely comes from his time as a part of The Nexus. The second hit in the box will either be an autograph or a mat relic from Wrestlemania XXVIII. 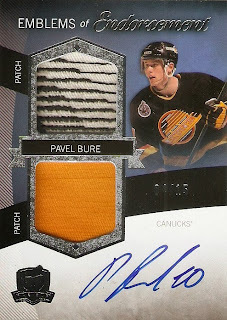 Of course, I was hoping for the auto, but expecting the mat relic. 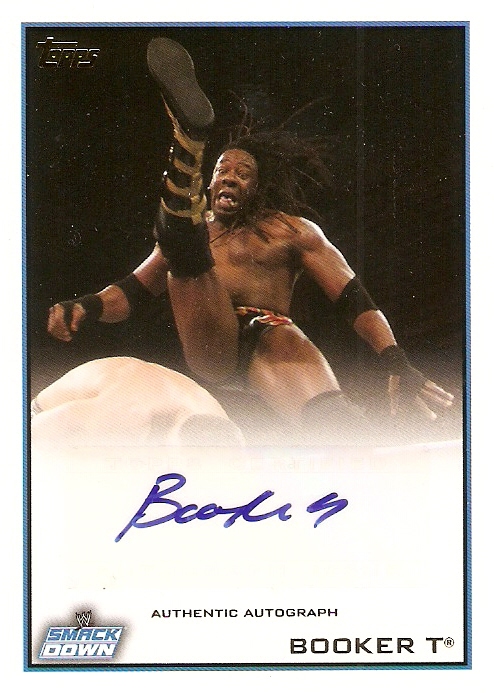 Luckily for me, I pulled an auto, and it happened to be a pretty good one: Booker T. He is known as the "five time, five time, five time, five time, five time WCW Champion, is the current GM of Smackdown, and is an eventual WWE Hall of famer. Not a bad pull at all. If anyone is a wrestling fan, I would definitely give this product a look. You get a full set, plus two hits at a pretty affordable price. 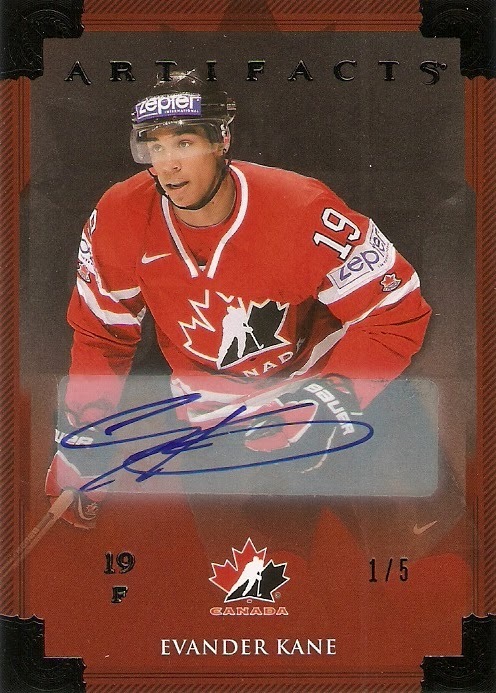 This really is one of the better value purchases in cards of any sport, so give it a shot. 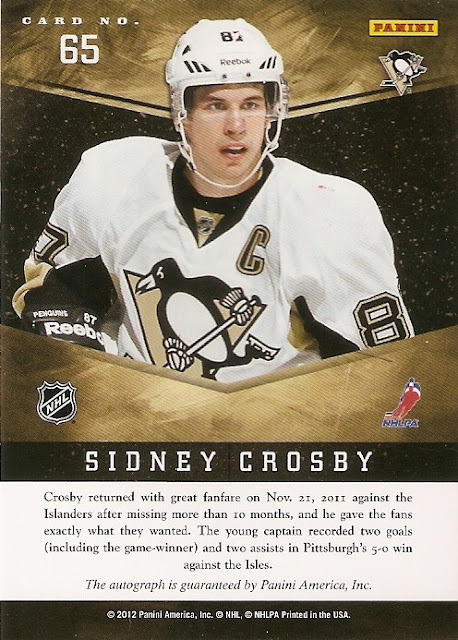 I know that redemptions can be a pain, but if a redemption means I can get an autograph of Sidney Crosby, as opposed to it being scrapped entirely because he didn't get them sent back in time, then by all means, give me a redemption. I'll wait a few months if I have to. Luckily, my wait for one in particular is finally over. Sure enough, I have an e-mail from Panini in my inbox saying that one of my redemptions has been filled. 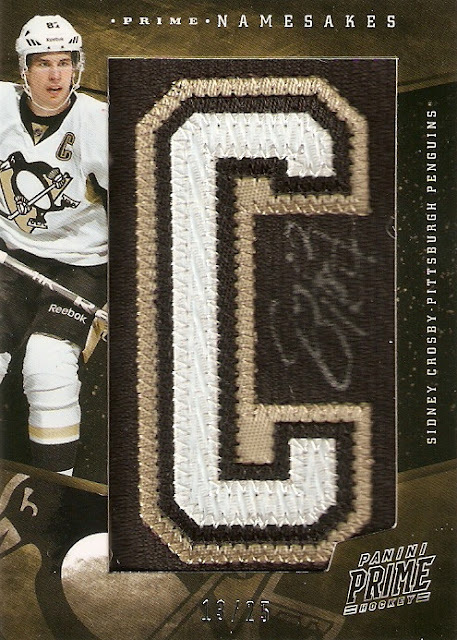 Now, I have a few out, but it just so happened to be my Sidney Crosby Namesakes autograph from 2011-12 Panini Prime. Just to show a preview of the kind of awesomeness heading my way, here's a few other Namesakes cards from Prime. It should be delivered via FedEx either Saturday or Monday, and I will certainly post it up here as soon as I am able to. Hey, everyone. I just wanted to give a quick heads up, especially to those who are waiting on trade packages from me, that things have gotten a little busy over here. So, if you're waiting on anything from me, have no fear, I haven't forgotten about you, and I'll get everything out as soon as I can. Thanks for reading! With some major cuts to 2012-13 hockey products announced, and the Superbowl on the horizon, I decided to pick me up some football cards. 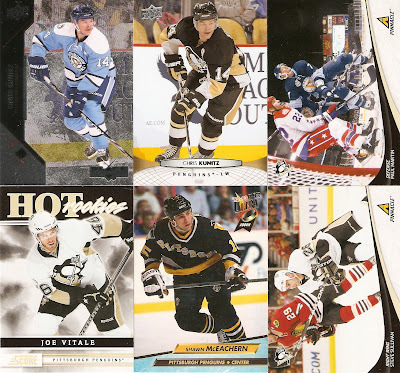 I went with 2012 Panini Limited, which is basically a one-pack box, and if you've read this blog for any length of time, my love for Limited of any sport should leave this as no surprise to anyone. Each box contains seven cards. Of those seven, it usually works out to three base cards, one insert or parallel, and three hits, one of which is guaranteed to be an autograph. Here's a quick look at what my box contained. Base: Reggie Bush 109/399, Charlie Joiner Legend 67/349, Tyrone Crawford Phenom 63/299. I did ok here. 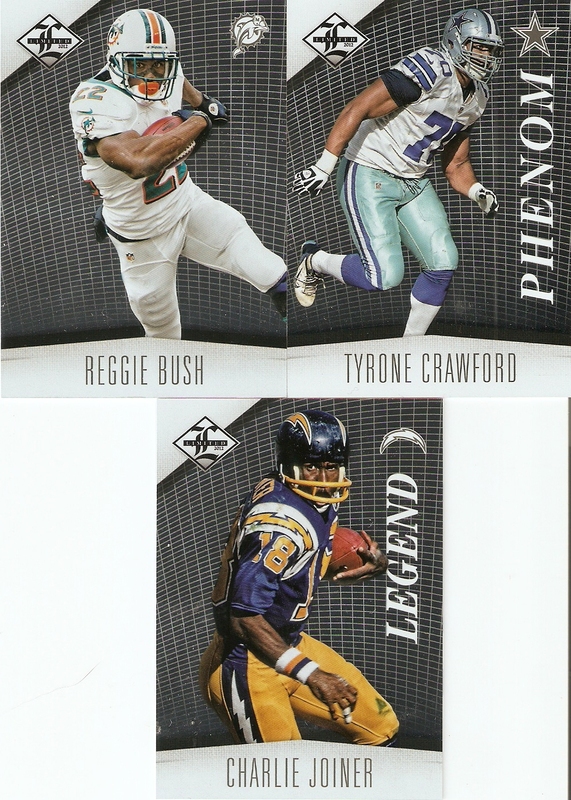 No major superstars, since Reggie Bush has kind of fallen off the map, hobby-wise at least, but the fact that I got one Legend and one Phenom is pretty cool. Unfortunately, I don't care much for the Dolphins, Cowboys, or Chargers, but that's just the way it goes sometimes. I do like how they kept the serial numbering on the base cards. For some reason, they took that away from Limited basketball this year, and I've always liked that feature to this set. 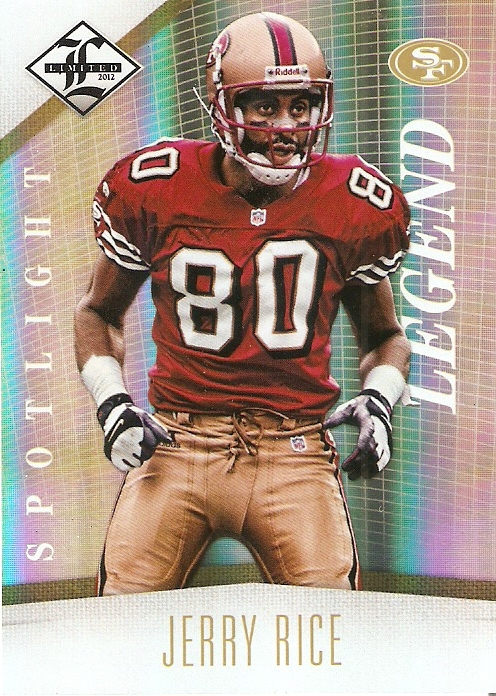 I hit it really big with my insert on this pack, landing a Jerry Rice gold parallel, numbered 18/25. Considering all of the inserts, all of the players, and all of the one-and-done rookies that are included in football products, the fact that my one insert is a super-low numbered card of the greatest wide receiver of all time is pretty stinkin' awesome. Now for the hits! As I said earlier, each box is guaranteed to contain one autograph. Mine must have been a lucky box, because as you will see, I opened up two autos and two patches, and all three are from teams playing in the Superbowl! 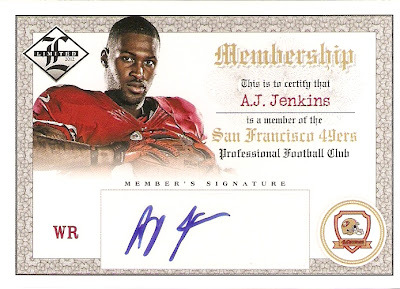 First off is a Membership auto of AJ Jenkins, numbered 60/99. I saw this cards and figured, hey, a member of one of the Superbowl teams. Awesome! Unfortunately, Jenkins has yet to do much of anything for the NFC Champions. In fact, when I googled him to find out some info on his season, the first thing that came up was an article titled, "49ers AJ Jenkins Not Producing." Uh oh. Still, this next card more than makes up for it. Here is a FANTASTIC looking patch card of Baltimore Ravens running back Ray Rice, numbered 15/15. 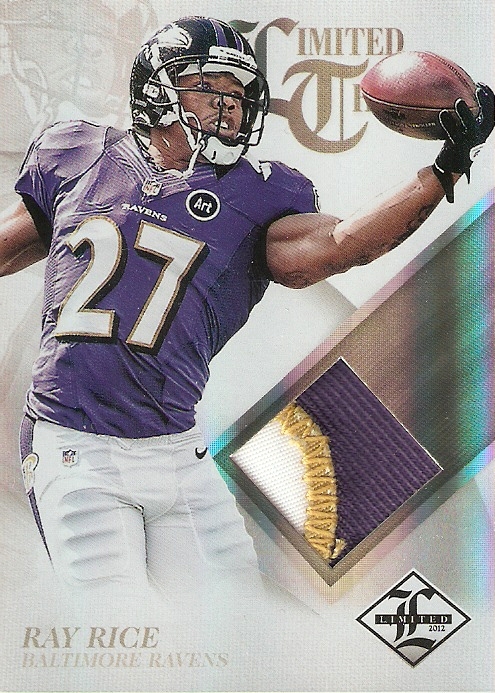 I'm pretty indifferent to the Ravens as a whole, but I will say that their color scheme produces some beautiful looking patch cards. 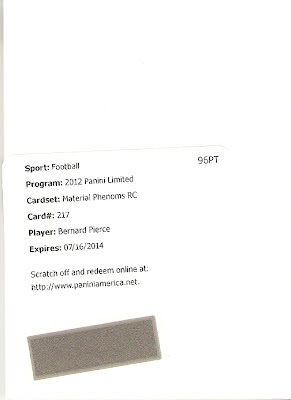 Oh, and speaking of Ravens running backs, my third hit was a redemption for an autographed Phenoms patch card of Bernard Pierce. Pierce is in his first season in the NFL, and is number two on the depth chart behind Rice. He played in all 16 games this season, taking 108 rushes for 532 yards and 1 touchdown. I would say that there will be more Limited football on the horizon for me, but with Limited hockey coming out soon, I'm not too sure about that. Either way, even if this ends up being my only pack of Limited football this year, I was very happy with what I got. With a low numbered card of one of the sports greatest legends, plus two autographs and two patches, how could I ever complain? Of course, the Crosby is nice, and you can't beat four Lemieuxs. 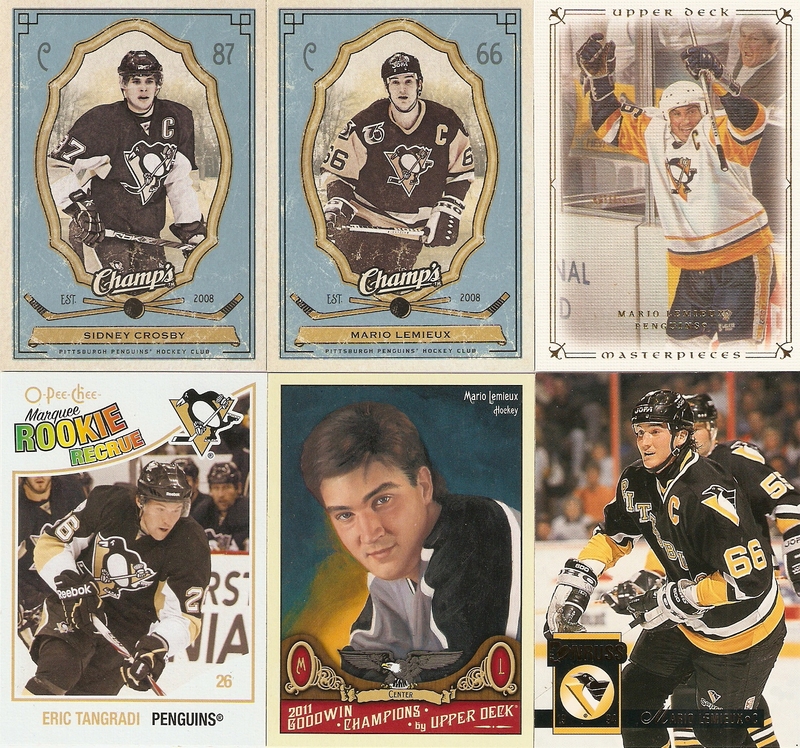 The one I'm curious about is the Eric Tangradi rookie. Right now, he is in competition with rookie Beau Bennett for the left wing on the Evgeni Malkin/James Neal line. 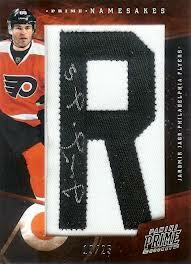 If he gets the spot it will be a HUGE boost for his career, and his cards will definitely increase in value. Here are a few others, as well. 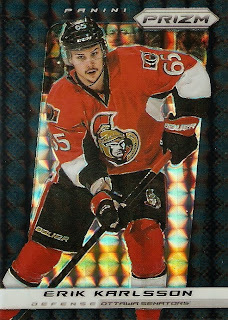 I've always liked the Black Diamond cards, but they scan horribly. The Shawn NcEachern rookie is cool, too. 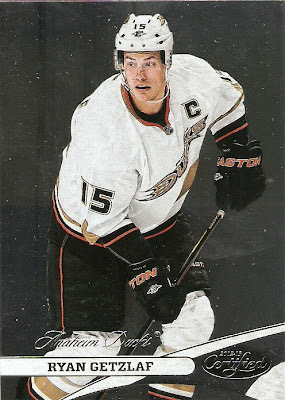 I know he made the rounds during his NHL career, but I remember him as one of the better players on the team for a couple of the EASports NHL games that I played in the mid 90s. It's always nice to receive free cards, and when they are Penguins, those cards will always be appreciated here. I just completed yet another trade with one of my favorite fellow traders, Douglas from Sportscards from the Dollar Store. I've said it before, but he has EASILY been my greatest asset in completing those sets I am oh-so-close to finishing and making some serious headway on the ones I have more work to do on. Anyway, here's a look at some of the sets he has been good enough to help me on, and how close I am to completing them. 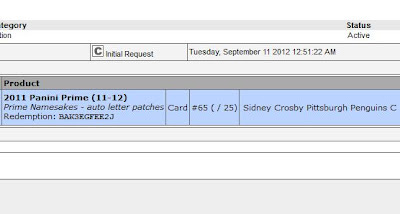 2011-12 Certified: 48 cards (43 left) - How did I not already have this Crosby??? 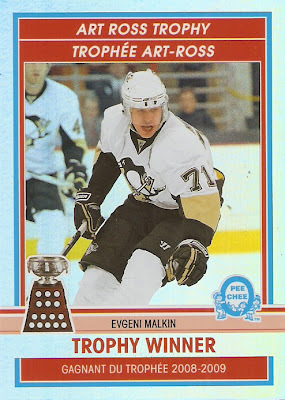 He also sent me an Evgeni Malkin Trophy Winners card from 2009-10 O-Pee-Chee that he pulled from a re-pack. Some companies don't know how to do shiny cards very well (I'm looking at you, Topps) but this card looks fantastic! Thanks for the help, Douglas. It's always appreciated. I haven't sent out the return end of this trade though, mostly because I worked four consecutive 12-hour days last week and forgot we had even completed the trade until I saw these cards in my mailbox. Whoops. They'll go out tomorrow, so look for them in your mailbox soon! I know it's a little late to be posting Christmas presents, but who cares? 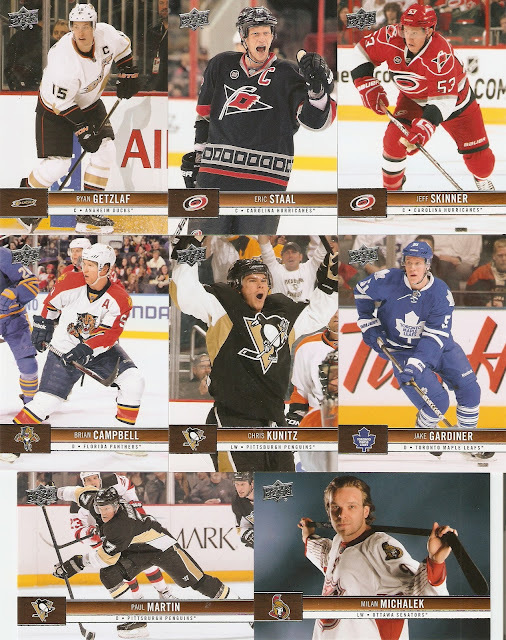 The wife & each filled each other's Christmas stockings from "Santa Claus" this year, and I was happy to find three retail rack packs of 2012-13 Upper Deck hockey. 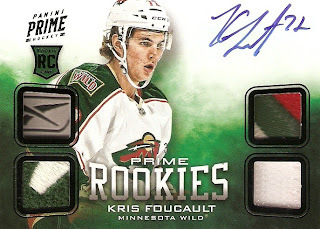 I didn't get anything groundbreaking in my packs, but I did some cool stuff nonetheless. 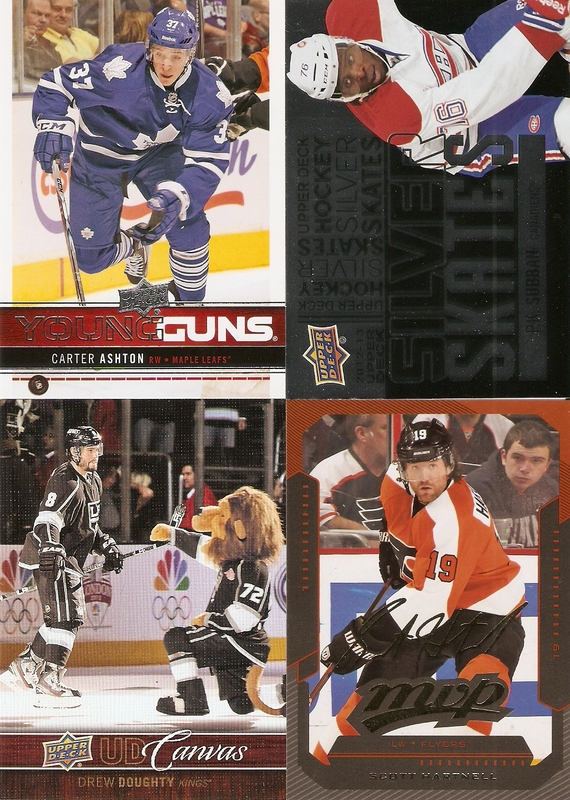 There were a total of four inserts cards: Carter Ashton Young Guns, PK Subban Silver Skates, Drew Doughty Canvas, and Scott Hartnell MV. Tghe important thing, though, was the set needs. I got a total of 15 cards for my base set, leaving me (at the time) with just 9 to go. Since then, I have traded for seven of those cards. Just two more left! While burning through some money at my LCS this past weekend, I mostly went with stuff that either I needed for my sets (2012 Allen & Ginter) or stuff that I knew I would like anyway (2012-13 Limited Basketball), but for my final box purchase, I indulged a curiosity with 2012 Panini Golden Age. 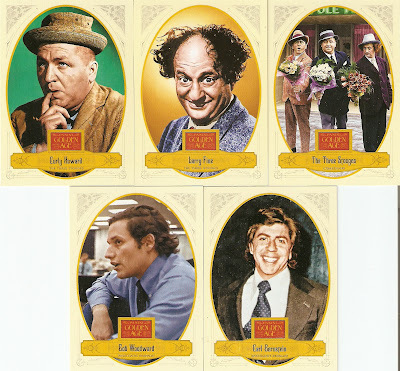 This set seems to be Panini's answer to Topps' Allen & Ginter and Upper Deck's Goodwin Champions. 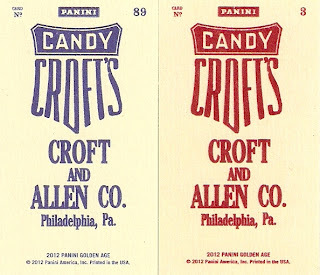 Both of those releases have gone to show that there is definitely a market for those old-timey-looking cards, but Panini takes their release in a slightly different direction. Here, not only is the look of the cards vintage, but the subjects are, as well. 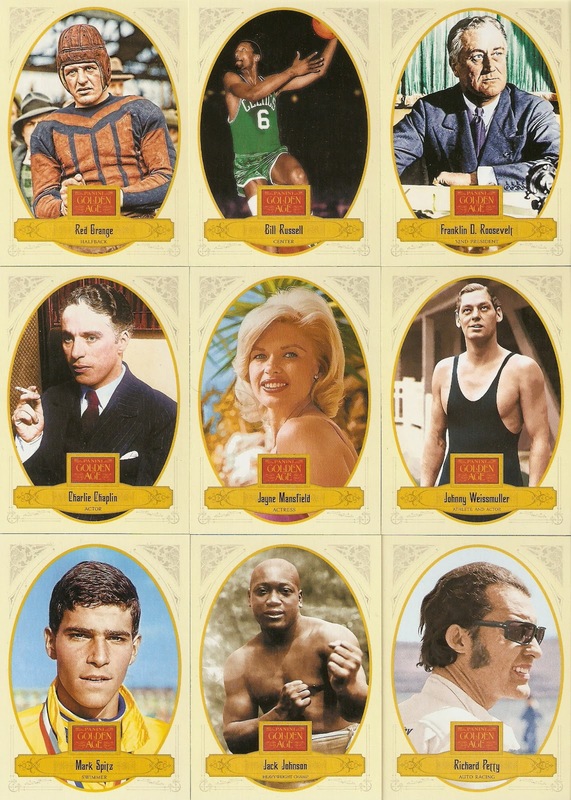 All 146 cards feature athletes, actors, and other pop culture figures of the past. 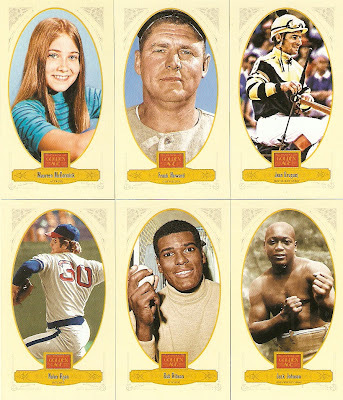 From what I opened in my hobby box, this appears to definitely be a baseball-centric set, but there are plenty of other sports as well. Anyway, here's a look at what I got. 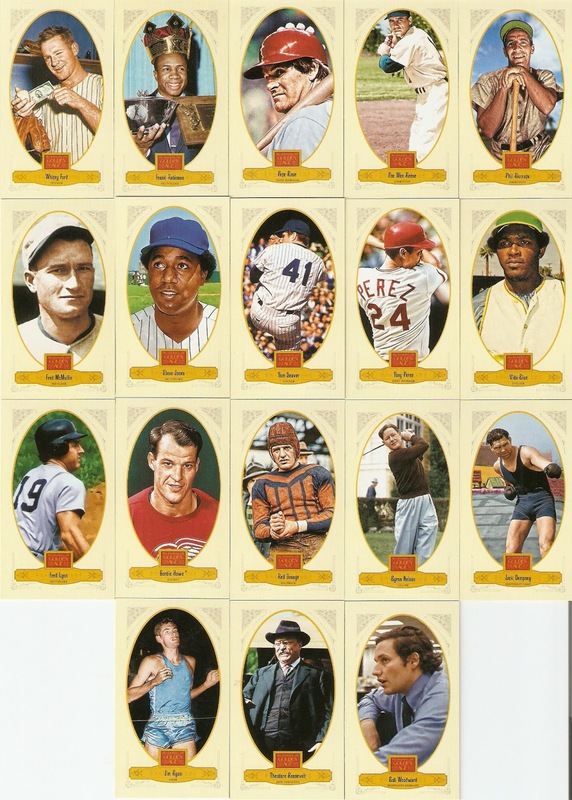 Baseball: There are plenty of hall-of-famers and other players of prominence, but the refreshing thing here is that we aren't seeing the same photos that Topps and Upper Deck have been rehashing year after year. I especially love the photos used on the Robinson and Musial cards. a horse, a horse owner, a triple-crown-winning horse owner, a track and field star, w writer, a jazz musician, and a plane. My favorite non-baseball ones have to be these, though. 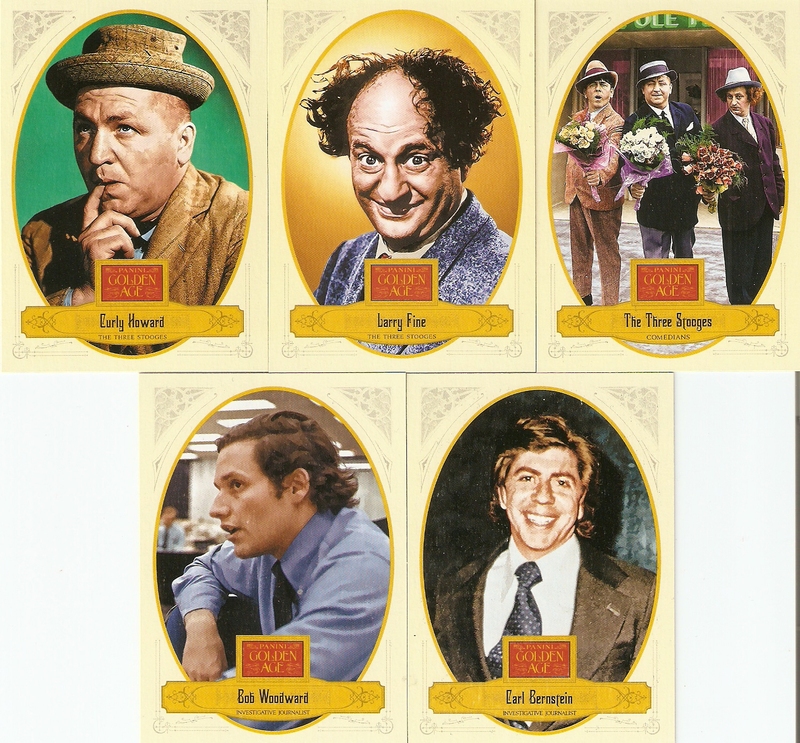 All three Stooges each have their own card, plus a card of the trio together. 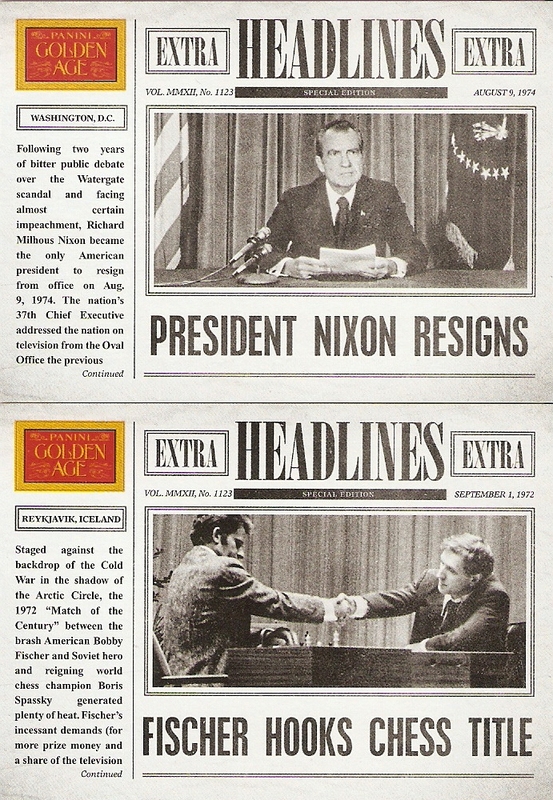 We also get cards of Bob Woodward and Carl Bernstein, the two investigative journalists who were responsible for breaking the news of the Watergate scandal. Well, it just wouldn't be a vintage-inspired set without those minis, would it? 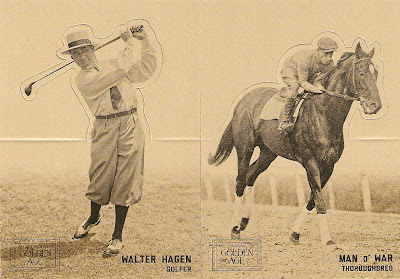 Like some of the others, Golden Age has a couple of different back that they use for the mini cards. 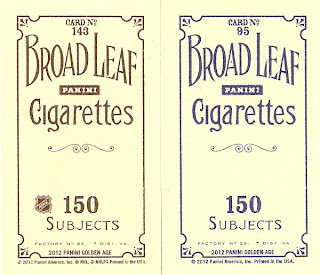 Their base mini is in tribute to the Broad Leaf Cigarette Brand that was on the back of some of the T-206 cards.The base mini is printed with black ink on the back, while there is a much more rare version printed in blue. Here are the black-backed Broad Leaf minis that I pulled form my box, including the only hockey player in the set, Gordie Howe. 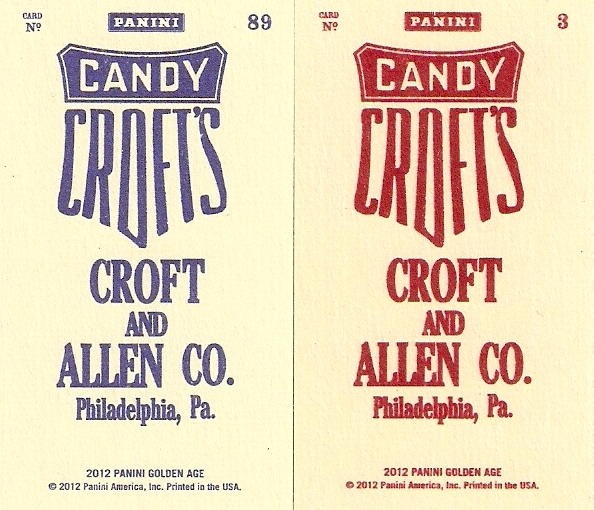 Panini also references a former company producing tobacco-era cards with blue and red backed Croft's Candy variations, paying tribute to one of three companies on the backs of 1909 E92 cards. 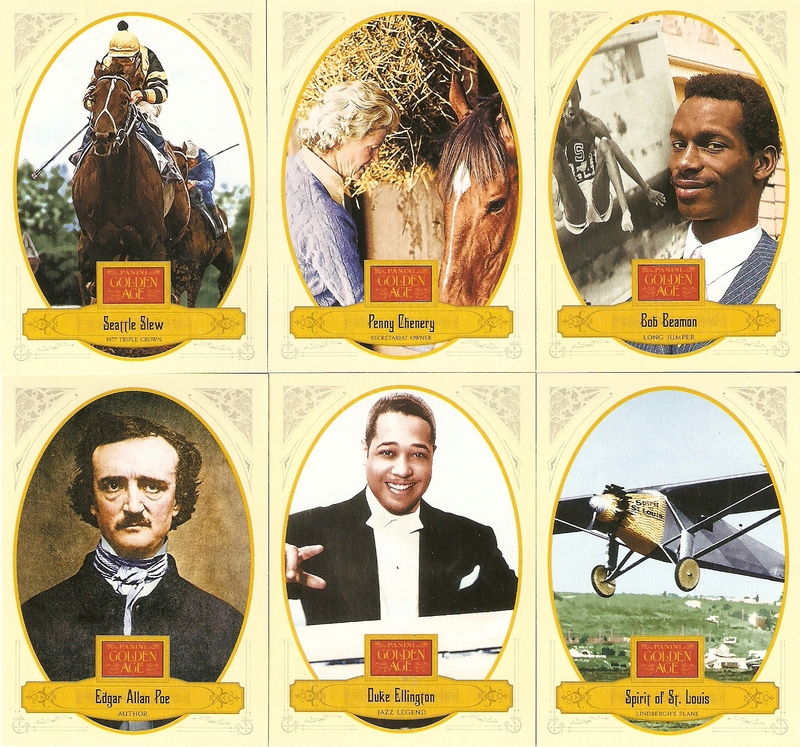 Each box also contains a box topper, which will either be a tribute to classic movie posters or a felt pennant that pays tribute to the 1916 BF2 Ferguson Bakery Felt Pennants. 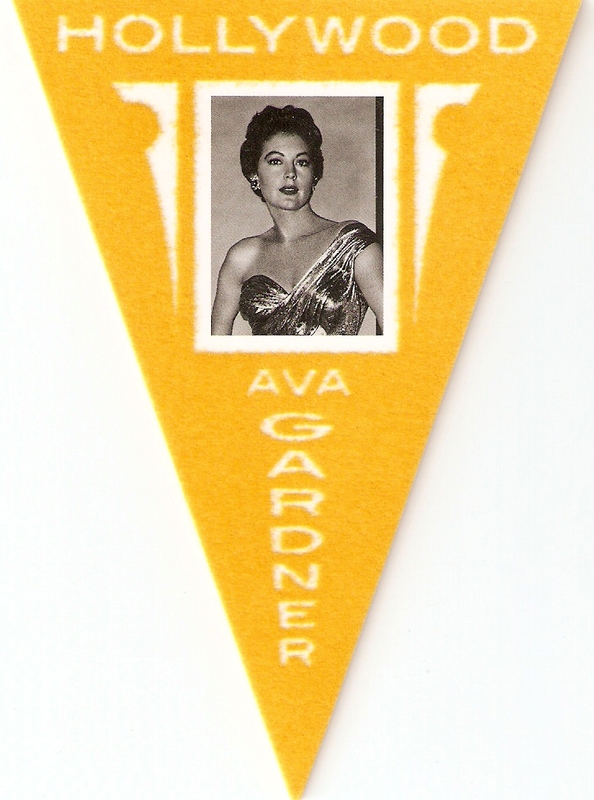 Mine was a pennant of Ava Gardner. Not bad. As far as inserts go, there weren't a whole lot of them in a box, which is kind of the way it should be. 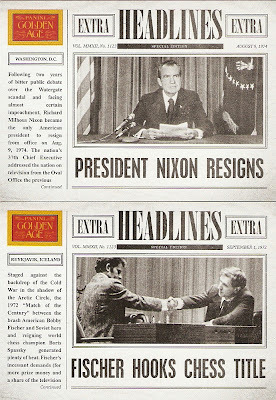 If these card are supposed to be special, after all, they should be treated as though they are special.One of these sets is Headlines, which I found two of: Richard Nixon Resigns as President and Bobby Fischer becomes the first American World Chess Champion. Other inserts include Batter-Up, which folds out as a pop-up type of card with a silhouette around the subject. The two I pulled were of golfer Walter Hagen and thoroughbred Man O' War. The last of the inserts was a one-per-box Newark Evening World of Jean Cruguet,the jockey who raced Seattle Slew to the Triple Crown in 1977. This set is based on the 1907 Newark Evening News Supplements set. Each box also contains one Historic Signatures autographed and one Museum Age memorabilia card. 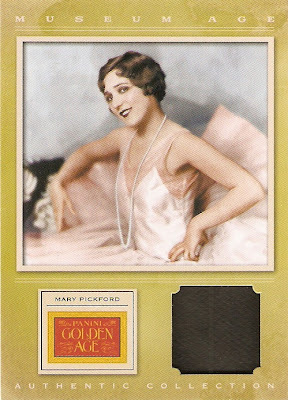 My Museum Age card is of Mary Pickford, an actress from the early 20th century. According to the back of the card, Pickford had appeared in nearly 200 films b the time she was 20 years old. She is also known as being one of the founders of the Academy of Motion Pictures Arts and Sciences. 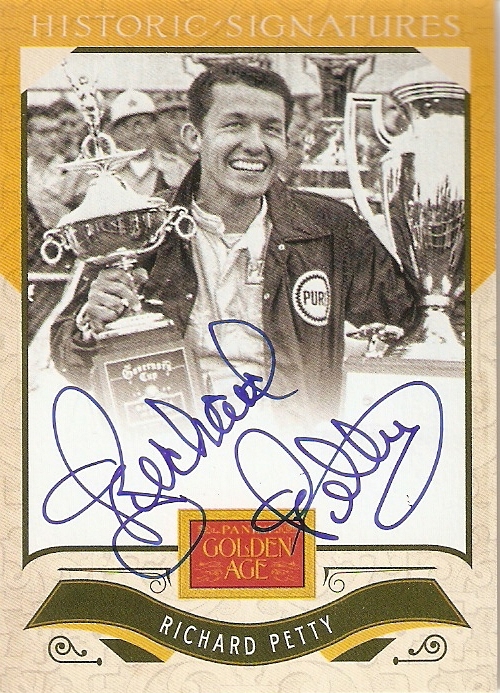 I really lucked out with my Historic Signatures auto, landing one of racing Legend Richard Petty. Petty is a 7-time NASCAR Cup Series Champion and a 7-time Daytona Cup winner. He retired from racing in 1992 and was inducted into the NASCAR Hall of Fame as a part of its inaugural class in 2010. Lastly, I also received an extra special surprise in the form of a case hit. 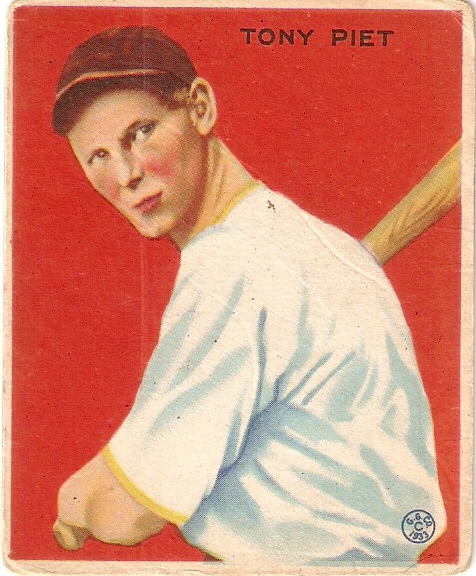 For this issue, they don't produce a super-rare card, instead, including a buyback card from the 1930s or 1940s. Mine was a 1933 Goudey card of Tony Piet from the Pittsburgh Pirates. 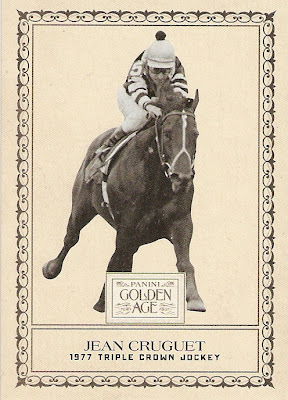 He may not have had a long career of any consequence, but it's still a really cool card to pull and is now by far the oldest card in my collection. Well, there you have it for this break. 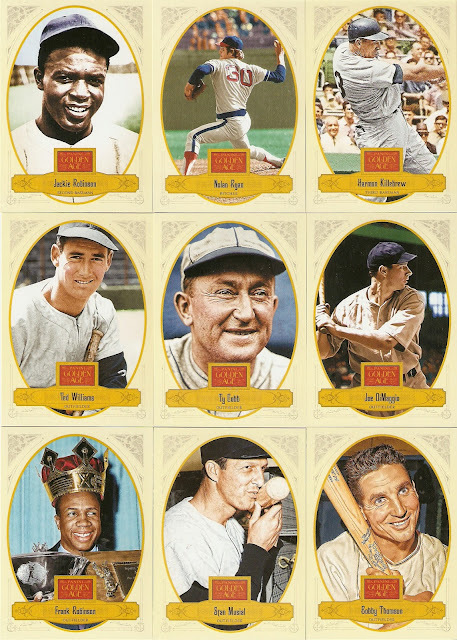 considering how many baseball players are in this set, I thought they were very smart with the photos they chose and how they were able to obstruct or erase the team logos without making it too obvious. I would definitely recommend this product for anyone looking for something different. My one box got me about 77% of the set, so I'm not sure if I'll get another one or just buy singles, but either way, this is a very fun product to open.